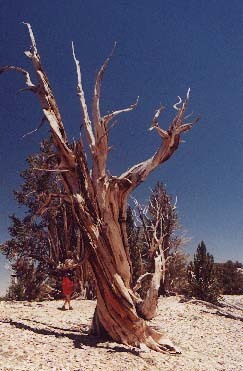 Twisted & gnarled trees are older than the Redwoods & Sequoias! For many years now, scientists, archeologists, and historians have relied on a dating system known as radiocarbon dating. It was discovered back in the 1960's that this process was flawed and needed to be calibrated. 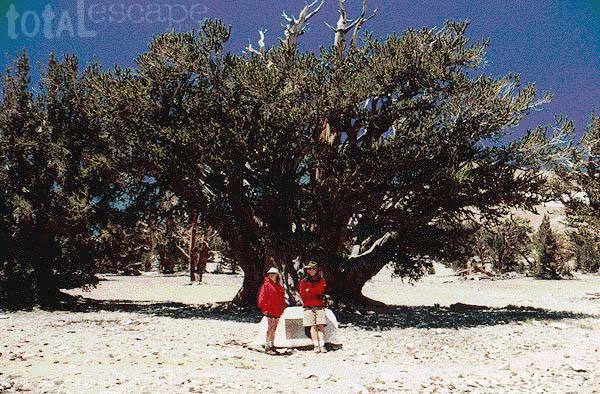 The wood from bristlecone pines helped correct this process by providing samples that could be precisely dated. 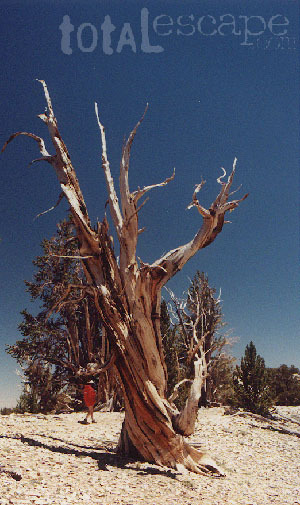 Scientists dated these samples by counting their growth rings; they then measured the amount of carbon-14 (C-14) in those same samples. They discovered that the radiocarbon dating process was providing dates that were "too young" and established a calibration factor to correct the dating process. 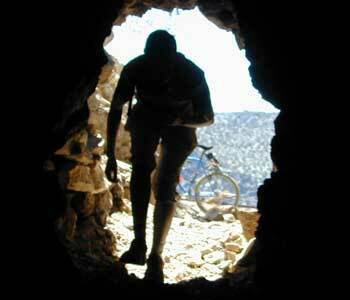 A few dirt roads for SUV travels or mountain biking w/ great views of the Eastern Sierra range. If you want privacy, away from crowds camping options, there are plenty to choose from. The only developed Campground is Grandview & is very popular with astronomers & RVs, especially during a new moon summer weekend. The best fishing & aspen forests are on the back roads just outside the parks boundaries on the eastern slopes. 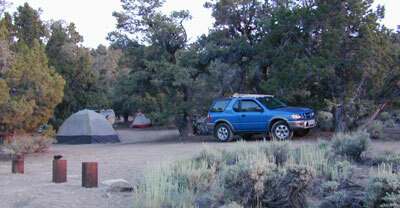 4 wheel drive is needed to reach some spots, but there are just many ideal 2WD accessible sites. Westgate Pass Rd. (SR 168) & White Mountain Rd. 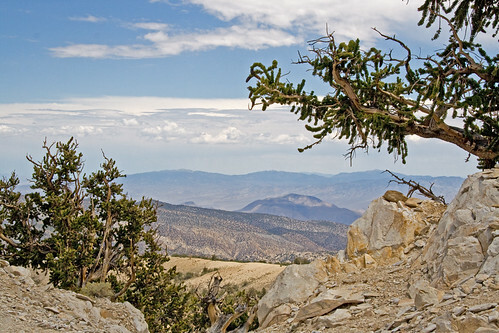 up to Schulman Grove at 10,000' high elevation. Open : Daily June - late October. 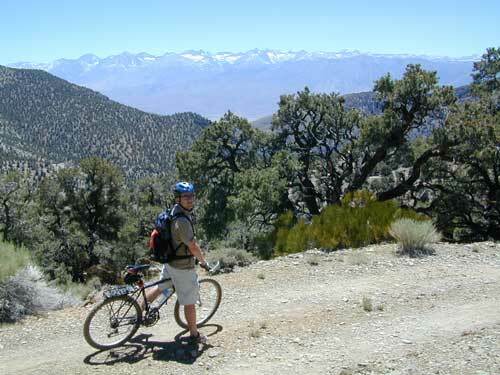 Get an Inyo Forest Service Map & explore the dirt roads. 4 wheel drive is required for some routes. They will lead to a quite different terrain than that of lunar scapes on the front side. 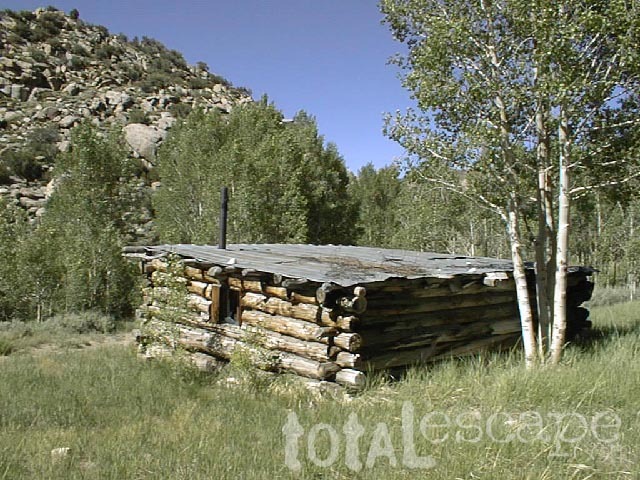 Find aspen lined creeks, lush meadows & lots of beavers, fishing, seclusion. Some primitive camp spots are set up along the waters edge on Cottonwood Creek. 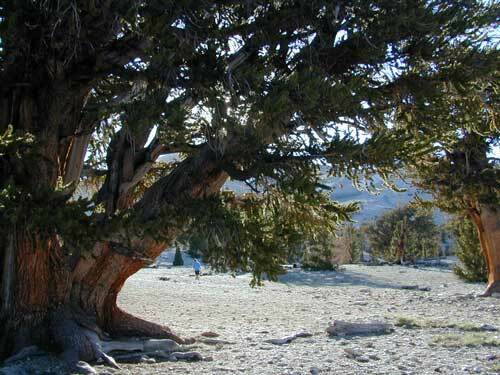 Obtain a free fire permit if you plan on camping back here. If you arrive late, around nightfall to Grand View Campground, head to the back of camp & take the bumpy dirt road that leads down to the abandon mine. There are numerous camp sites along this route. No picnic tables or bathrooms tho. Altho there are several wilderness boundaries around this region, locked gates, research facilities and limited vehicle access to the groves, there are still numerous dirt roads to explore. Most are high clearance, and some may require 4x4 low. Silver Canyon will leads from the upper mountain ridgeline at pinyon forests, all the way to the valley floor at Laws (elevation 4113') the railroad museum, near Bishop, California. 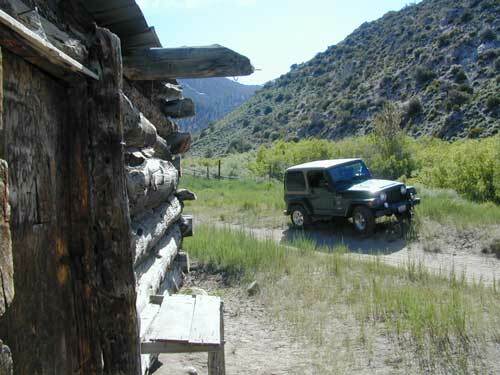 Cottonwood Canyon is a popular day trip for 4 wheel drive vehicles. Aspen groves and big beaver-run creek with camping and fishing spots. DEAD END: The historic ranch and road beyond can get crowded on summer weekends - as it becomes a tourist parking lot, a photographers stop, a 3 point turn around for those just passing thru, as well as numerous campers holding down their prime, remote, creekside campsites. Crooked Creek offers vast open skies and boulder gardens of all sorts. Meadows, mud, hiking and picnic spots. Minimal campers and locked gates. Inyo Road #6S01 - Wyman Creek Road leads down to the deserts, eastward to Hwy 168 at Nevada border.